The rise of mobile digital devices has already altered the environment of local news and information. Traditional news organizations and other community-based information providers are trying to respond to audience interest with pervasive, portable, real-time local information. To understand this changing information environment, the Pew Research Center’s Project for Excellence in Journalism and Internet & American Life Project conducted a national survey in partnership with the Knight Foundation. The survey used both landline and cellphones. The survey was conducted in English and Spanish from January 12 to 25, 2011, and involved 2,251 adults ages 18 and older. Our aim was to explore the role that cellphones and tablet computers play in people’s patterns of consuming and contributing to community information. A major share of the funding for the survey came from the John S. and James L. Knight Foundation; its senior leaders participated in constructing the survey and assessing the data. Cellphone usage has already penetrated deep into American society. Fully 84% of American adults own a cellphone, a figure that has remained relatively stable since mid-2008. Now tablets are spreading quickly as well. Indeed, the survey finds that tablet computers such as the iPad, which have existed less than a year, have become one of the most quickly adopted consumer goods of the recent era; tablet penetration almost doubled in just four months’ time, from 4% to 7% now. (As virtually all iPad owners are also cellphone users, the total population of mobile device owners (cellphone and/or tablet users) is 84%. Two-thirds of cellphone users take advantage of mobile phone features such as texting, e-mailing, web browsing and “apps” (software applications that allow mobile device users to play games, access web content and access media or data). Only a third of Americans now say they use their cellphones just for phone calls, according to the survey. The majority of those of who own a cellphone or tablet computer (56%) get some kind of local news and information on their mobile devices. That equates to 47% of all adults. Adults tend to use mobile devices to get local news and information that serve an immediate need. We asked specifically about the kinds of local information obtained through mobile devices. The most sought-after material was local weather. 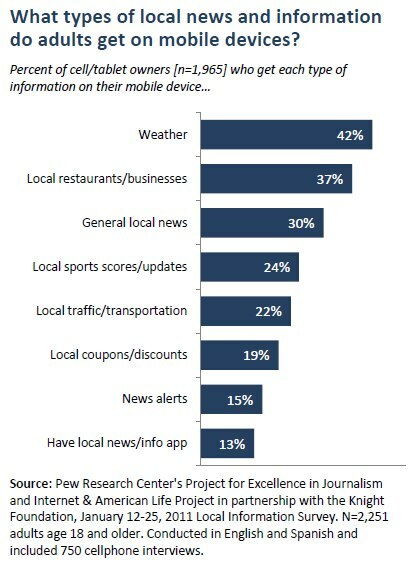 About 4 in 10 mobile phone and tablet owners (42%) use their mobile device to access local weather information. That represents 36% of all American adults. The next biggest category among cellphone and tablet owners was information on restaurants or other local businesses (37%). General local news came next (30%), followed by other news such as up-to-the minute information of local sports scores (24%) and the latest local traffic and transportation (22%). Mobile access to coupons and discounts from local businesses, on the other hand, has yet to be used widely. The same is true for local news alerts. Respondents were also asked a separate series of questions about what sources they rely on most for a wide range of local news areas. This list of areas asked about included crime, community events, schools and education, politics and cultural events and social services. Just a small fraction cited a mobile device as a primary source for any of these. 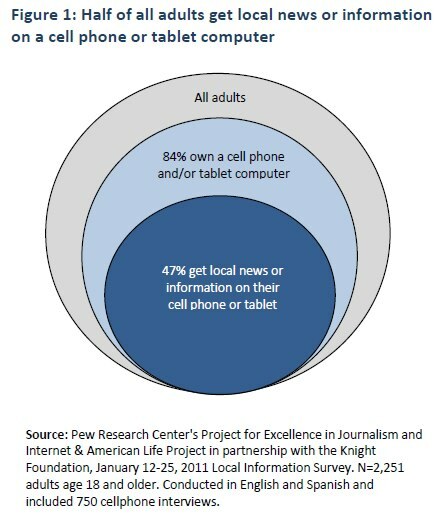 Thus, for now, the data indicate that mobile devices are mainly a supplemental platform for local news and information, not a primary source. Who consumes local information on the go? Adults who consume local news on the go reflect many of the same traits as owners of mobile devices: They are disproportionately young, affluent, highly educated and live in non-rural communities. This group also tilts towards newer residents of their communities. Younger users are also more likely than others to use their mobile devices for specific types of local news and information. The one exception is among those receiving local news alerts sent by text or e-mail to mobile devices. Here, mobile device-owning adults age 30-49 are slightly ahead of those 18-29. Still, the results suggest that if these patterns hold as people age, mobile is likely to become a much more powerful factor in news consumption. In addition, among cell/tablet owners, those with higher household incomes and higher levels of educational attainment are more likely to use their mobile devices to get these kinds of local information. Overall, 63% of college graduates who own cellphones or tablets get local news and information on their mobile devices, compared with just 37% of cell/tablet users who have not completed high school. Likewise, 7 in 10 cell/tablet owners (70%) with household incomes of at least $75,000 get local news on their mobile devices, compared with just over half of cell/tablet users with incomes below that level (54%). Those who use their cellphones or tablet computers to get local news are more enthusiastic in some respects than others about their communities and the role they play there. They are also more likely to feel that technology has made news consumption easier, and to take advantage of a wide range of media sources. More than a third (35%) of mobile local information consumers say they and others like them can have a big impact on their community. That compares with 27% of those who do not connect to their communities on their mobile devices who feel that level of personal efficacy. Nearly two-thirds of mobile local information connectors (65%) feel it is easier today than five years ago to keep up with information about their community. That compares with 47% of nonconnectors who feel that way. Half (51%) of mobile local news consumers report using six or more sources/platforms monthly to get local news and information. That is more than double the number (21%) for those who do not consume local information on their mobile devices. The growth in tablet and smart phone use has brought with it a growing use of news applications, or apps. The adoption of apps, however, is not as rapid as tablets themselves. In the current survey, just over 1 in 10 mobile device owners (13%) report having an app that helps them get information or news about their local community. That equates to 11% of the total American adult population, and represents one-quarter (24%) of mobile local news consumers. 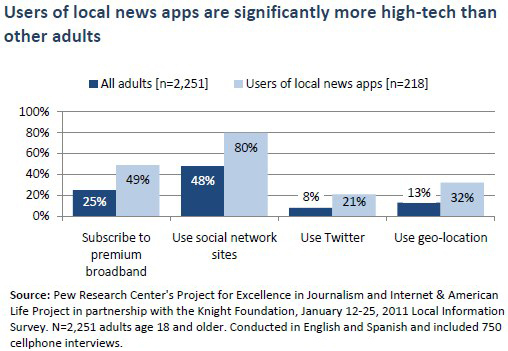 In some ways, the quarter of mobile connectors who have apps for local news and information resemble early adopters, and in other ways they do not. For instance, while they skew younger than other cell owners and other adults in general, which is typical of early tech adoption, they also are more likely to be Hispanic than other cell owners. And while the most educated and highest earners often lead the way with new technologies, the pattern of local news app adoption across income and education categories is not as stark or consistent as is normally the case. 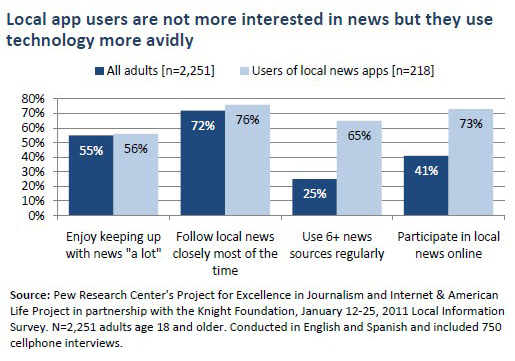 One interesting feature of local app users is that they are not necessarily more interested in news in general, or in local news specifically. In fact, they are no more likely than other adults to say they enjoy keeping up with news “a lot” or say that they follow local news closely most of the time, even when nothing important is happening. 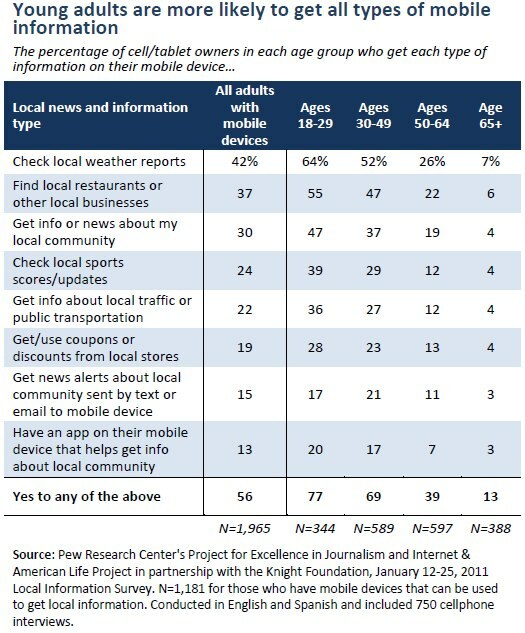 What sets local news and information app users apart even more is that they are much more high-tech than other adults. They are twice as likely as other adults to subscribe to premium broadband service at home and to use social networking sites like Facebook, MySpace or LinkedIn. They are almost three times as likely as other adults to use Twitter or geo-location services such as Foursquare or Google Latitude (see below).